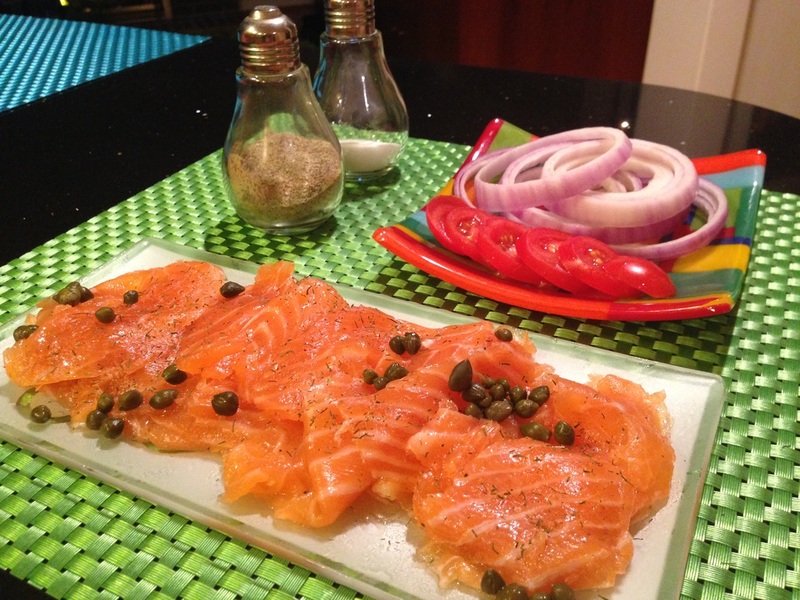 Given that I'm somewhat of a cultural Jew, its no surprise that I love lox. Even at a young age I would eat it at Yom Kippur break-the-fast parties and my friends' Bar and Bot Mitzvahs atop bagels (this was before my grain-free revolution) and beside slices of tomato, red onion and capers. Lox was also a crucial step in my journey towards sashimi loving. It's not raw but its raw. It sort of has the texture and look of thinly sliced raw salmon but its chemically cooked in salt. Ok, so yes, lox is incredible. One problem: it's massively overpriced. 25 dollars for a pound? And that's not even the good stuff. Oops, not in my budget for everyday consumption. The solution: make it your self! Buy salmon for half the price, coat it in sea salt (usually an inexpensive item), wrap it up for a day and you've got lox for little more than the price of raw salmon. Come on, people, let's drive the price of store bought lox down by refraining from buying it and make it ourselves! The hardest part is slicing it at the end, and I'll admit, that part is pretty hard. But, even if you botch the slicing, a few strategically placed lemon slices and a nice serving platter and you're back in dinner party business. I love lox thrown into omelets with some cream cheese, onion and tomato. It's also great just thrown between two slices of cucumber. 1. The only thing I did differently from the recipe above is that I soaked my cured salmon filet in fresh water for about 5 minutes after rinsing the salt off. This soaking takes the edge off the salinity. Don't soak it for much longer because it will get soggy and lose all its signature sea-saltiness. The recipe suggests that you tilt (so that the salmon doesn't end up sitting in the liquid that the salt draws out of it) and weight (I honestly don't know why) the filet. The picture shows how I did that. Yup, that's hot sauce, soy sauce and liquid smoke that is weighting my salmon and more hot sauce propping it up. Clearly, you'll need to reserve some refrigerator space (and possibly some large containers of condiments) for this project. Sun-Dried Tomato Marinated Salmon With Shaved Brussels Sprout Salad). It's also important to pick a fatty salmon or your lox may turn out dry. Seriously though, make this. Its hard to screw up (save for the slicing part- that's easy to screw up- but who cares? its all about flavor in the end anyway), its financially responsible and for some reason people find it super impressive. Enjoy the lox and enjoy the savings.